"For Anyone with a Backyard"
No home is complete without a porch. 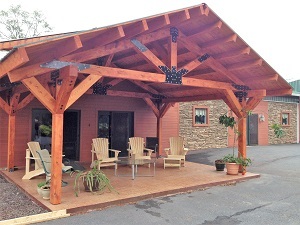 Enhance your house with one of our beautiful timber frame porches for the front or back yard. A porch or sun room expands your home by adding a relaxing place to socialize and 'bring the inside out' while staying protected from the elements. Use it as a place to relax at the end of a long day, to enjoy sunny springtime afternoons, or simply to improve the value of your home. Our pre-drilled, pre-cut components mean you can spend less time building and more time enjoying the comfort of your very own 'add-a-porch'. 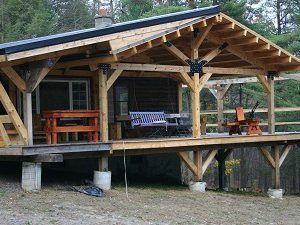 If you are looking to add a bit of 'wow' factor to your home, a timber frame 'add-a-porch' is the perfect way to do it!